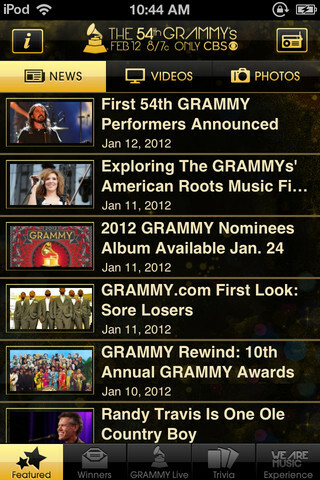 Developer Quote: "Enjoy Music’s Biggest Night® with the all-new GRAMMY Live mobile app, including the latest photos, videos, news, trivia and more!" I didn't realize the huge, musical Grammys event was taking place this weekend until someone in the office reminded me. Of course, I knew there would be an app for that... An app filled with information of what to expect before, during and after the big night tomorrow, February 12th! Tomorrow, music lovers can enjoy the musical spectacle of the 54th Annual GRAMMY® Awards, to be aired at 8:00 pm ET on CBS. To get the most background information, news, photos and videos about this this event, check out the comprehensive GRAMMY Live app now before the show airs. There's a neat bonus to this app. You will also be able to tune in to GRAMMY Live, which is three days of live-stream coverage of the VIP events leading up to and through the 54th Annual GRAMMY Awards. Like others, you probably have your favorite musicians whose musical career you faithfully follow. Go ahead and listen to your favorite GRAMMY Nominees with the very special GRAMMY Radio. For a little more fun for those trivia loving people, play the Guess the GRAMMYs interactive poll to select whom you think will this major musical award. There's not much time left to anticipate this year's winner of the Grammy's and to get in the spirit of this well-known and loved event, so get in the know while you can with GRAMMY Live! COOL CONCLUSION: "GRAMMY Live serves up the latest photos, videos, news and trivia about your favorite musical celebrities in an exciting build-up to the big Grammys event!"